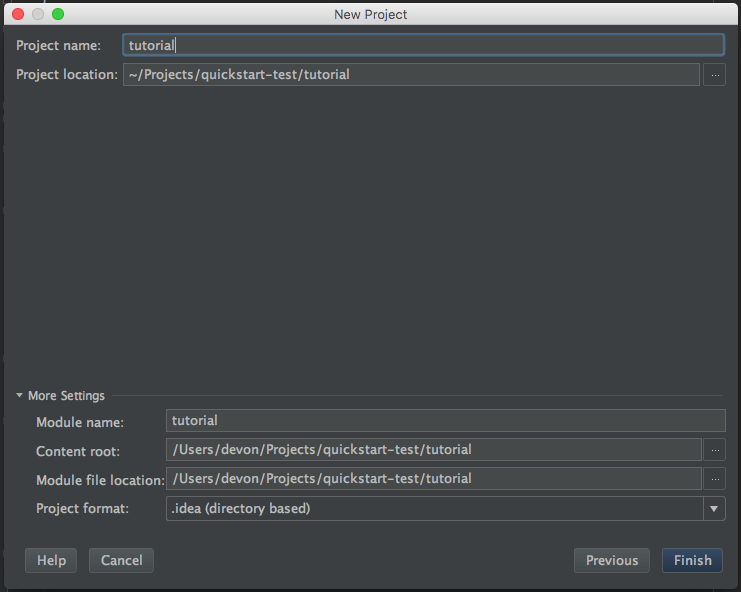 This guide will help you setup the IntelliJ IDE in order to work with GeoTools and follow along with the rest of the GeoTools tutorial. You have the latest JDK installed (8 at the time this article was written) installed. If not the Eclipse Quickstart provides instructions on how to do this. You have IntelliJ installed. This article targets IntelliJ CE 2016; however, previous versions at least as far back as 13 should work fine. Ultimate versions should also work fine. IntelliJ can be downloaded from JetBrains and generally works out of the box on common operating systems. 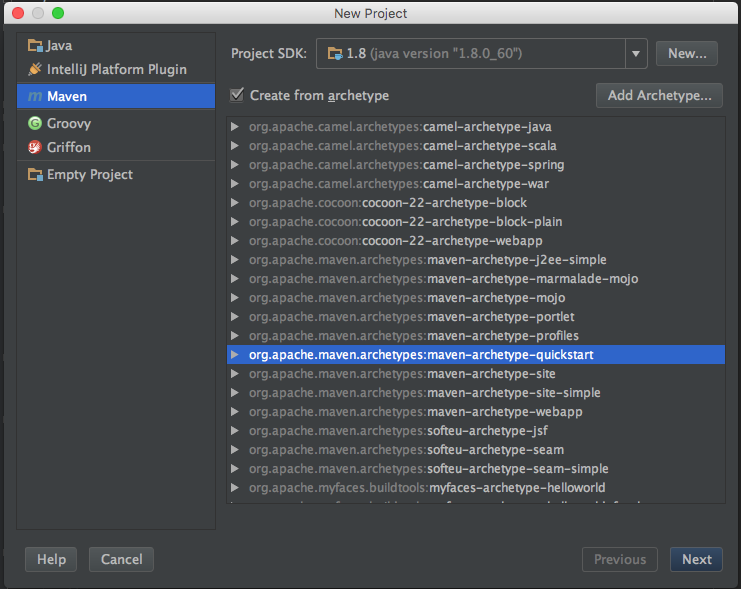 To start with we’ll create a new project using the Maven quickstart archetype. Hit next. The following screen we should be able to leave with the defaults. For our purposes IntelliJ’s bundled Maven should be fine, unless the version is lower than 3, in which case you should consider using a new external verision. Hit finish and our new project will be created. IntelliJ will show us our newly created Maven file and do an initial Maven build (let this finish before attempting the next steps, it shouldn’t take long). 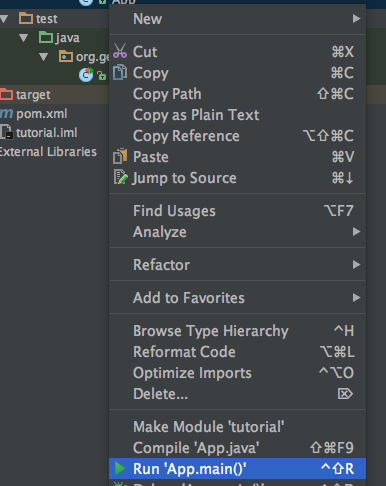 IntelliJ should also ask if you want to enable Auto Import for Maven dependencies. Let’s turn that on for the purposes of this tutorial, it will automatically detect changes we make to our POM file and automatically import them. 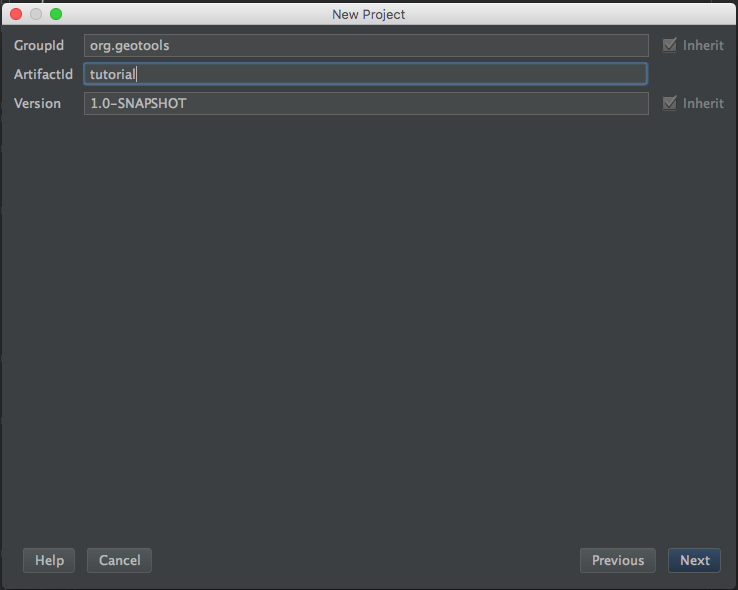 IntelliJ has created an empty App.java with a simple Hello World! along with a JUnit test case. You can run App or AppTest by right clicking on them in the Project Explorer and choosing Run from the context menu. If you’re following along with this tutorial a pre-loaded Maven repository may have been provided. We can use Offline Mode to ensure Maven doesn’t try to download any dependencies. The pom.xml file describes the structure, configuration, dependencies and many other facets of your project. We are going to focus on the dependencies needed for your project. When downloading jars Maven makes use of a “local repository” to store copies if the dependencies it downloads. Maven downloads jars from public repositories on the internet where projects such as GeoTools publish their work. Open up the pom.xml file at the root of the project. You can see some of the information we entered through the wizard earlier. We’re going to add three things to this file. First, at the top of the file after moduleVersion we want to add a properties element defining the version of GeoTools we wish to use. This workbook was written for 22-SNAPSHOT although you may wish to try a different version. We are going to add a dependence to GeoTools gt-main and gt-swing jars. Note we are making use of the geotools.version defined above. 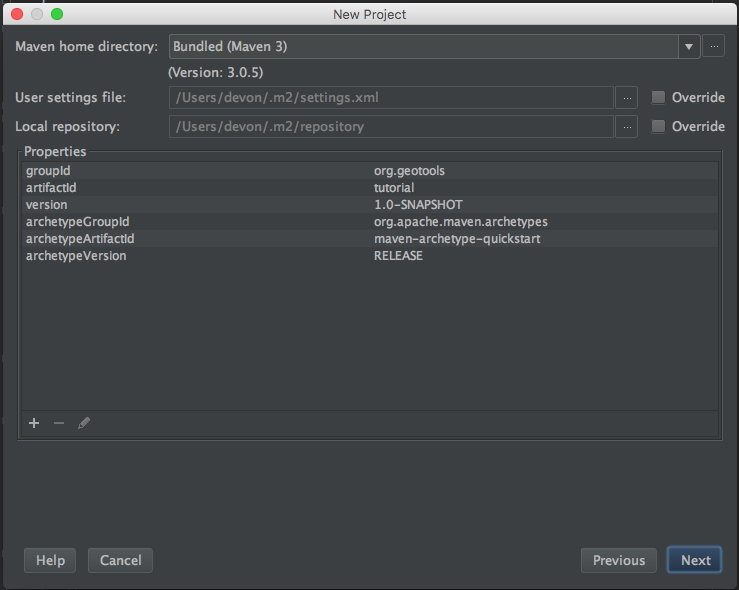 If Maven isn’t downloading dependencies automatically for some reason (maybe Auto-Import is turned off) you can manually download dependencies by right-clicking on your project and choosing Maven -> Reimport. Now that our environment is set up we can put together a simple Quickstart. 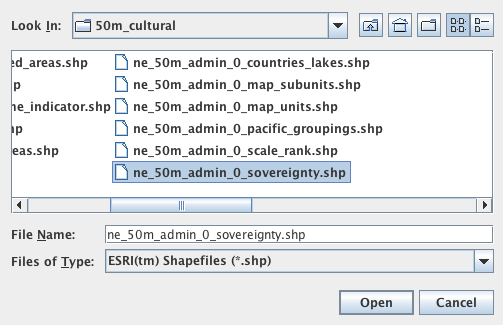 This example will display a shapefile on the screen. 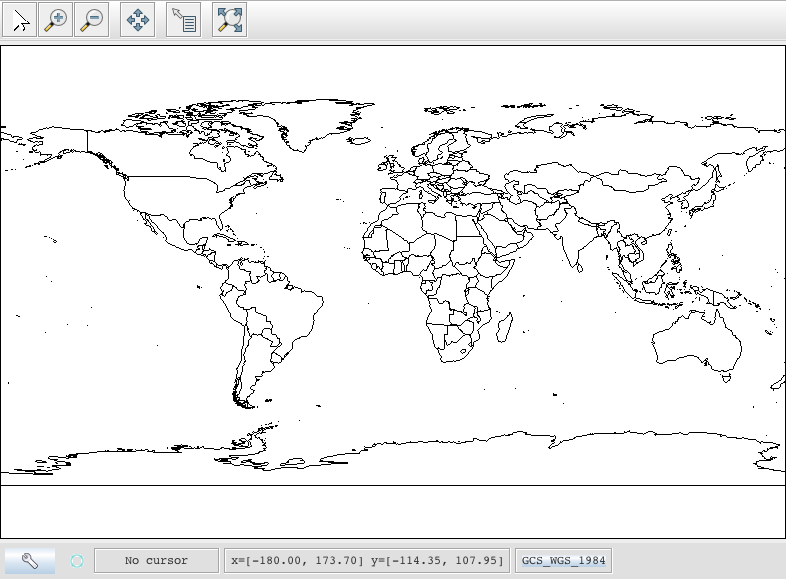 Let’s create a class called Quickstart in the package org.geotools.tutorial.quickstart . IntelliJ can create both the package and the class for us in one shot; right click on the org.geootools package in the Project panel and in the context menu choose New -> Java Class.